How about a Pledge Event, also known as a Bowl-a-Thon? Tenpin bowling is an extremely enjoyable sport and should be loads of fun for your supporters! Use the entire bowling center or just a few lanes. 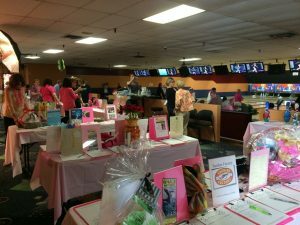 The fundraising committee sells lane packages for four to five people per lane and hold raffles and auctions throughout the event. Consider having a package that comes with the entry fee or lane package fee with extras like tournament memorabilia shirts, sponsored energy drinks, and/or a barrel of wine or crate of beers (depending on how lively your teams are). If you are serious about the idea of a bowling fundraiser, give one of our event coordinators a call and let them help you create a fundraising event.